Recycling gives an object a second life. Instead of something being forever buried in a landfill, it can be transformed and repurposed into something usable! Fortunately, most neighborhoods now provide a recycling service that supplies each house with a recycling bin and a weekly pickup day. And even if your neighborhood doesn’t offer this service, there are usually multiple locations in a town or a surrounding city that allow you to drop off recycled items. Use this Recycling Center Search, provided by earth911.com, to find a recycle location near you. Not sure what can be recycled? The rules are often different for different companies. 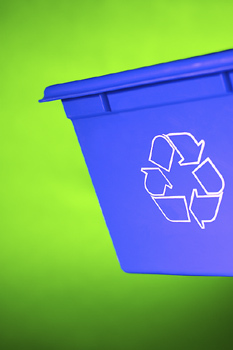 Your best bet it to question the company or location where you recycle. For specifics on what types of plastic, paper and other materials can and cannot be recycled, read The Consumer Recycling Guide. All you have to do is start a separate pile of recyclable goods in your house, apart from the non-recyclable items. Fill the recyclable container with empty milk cartons and water bottles, trash mail and old post-its, soda pop cans, and dead batteries, and then either put the container on the curb for a truck to pick up, or take it to a recyclable drop-off location.